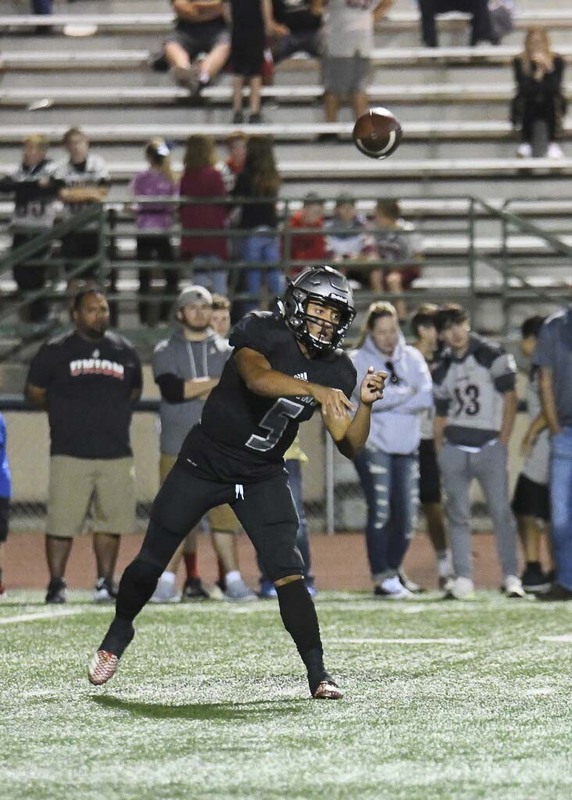 Editor’s Note: Late Friday night, Paul Valencia met up with Ryland Spencer, an analyst for Cascadia Preps who covers high school football throughout the Northwest. He was in Vancouver for the Union-Puyallup game. VANCOUVER — The top-ranked team in Class 4A football rallied from 14 points down to beat the No. 3 team in a wild game that lived up to the hype Friday night at McKenzie Stadium. Nile Jones scored on a short run with 15 seconds left, giving the Union Titans a 38-31 victory, capping a fourth quarter that belonged to Union quarterback Lincoln Victor. So says Ryland Spencer, analyst for Cascadia Preps. “He simply took over that game,” Spencer said. On the final drive, Spencer noted a great run by Victor, who kept the drive alive with a first down and stopped the clock by getting out of bounds. “This is a team that has been in it before and knew how to finish a game,” Spencer said. A game such as this one makes the travel worthwhile for a man like Spencer. This, he said, was the 341st high school football game he has attended in the past six seasons. “It’s one of the top 10 high school football games I’ve ever seen,” Spencer said. Puyallup led 10-0. Then Union led 14-10. Puyallup regained the lead. The Vikings went up 31-17 with 9 minutes left. Instead of that what Spencer expected, he said he sensed a shift. “The (Union) band kept playing and getting louder. The fans kept cheering and getting louder,” Spencer said, adding that Puyallup might have had a 14-point lead but somehow the Vikings did not have all the momentum. “When (the Titans) came out for their next drive, you could see their confidence,” Spencer said. Victor took over, from what Spencer could see. But a funny thing happened to Spencer in this, one of his top games he has covered. He had radio duties with KJR in Seattle, and he was called during Union’s epic comeback to tie the game. He was trying to watch, from behind one end zone, when Union was doing all the scoring on the other side of the stadium. He still could sense that shift, though. “When Union made it a seven-point game, it was over,” Spencer said. The Union defense might have given up 31 points, but the defense made the stops when it had to, Spencer said. He remembered the games Union has already played this season. A close victory against Mountain View. A win in El Cerrito, Calif., another game that went down to the wire. “I think that helped this team,” Spencer said. Helped the Titans improve to 5-0. “I can’t believe what I just watched,” Spencer said.